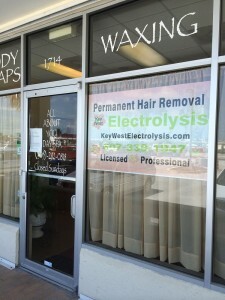 Welcome to the one and only world of permanent hair removal, welcome to electrolysis! If you have unwanted hair anywhere on your body I invite you to call me for a consultation. For over 125 years electrolysis has been the only recognized method of permanent hair removal. The technique permanently eliminates the germinative cells responsible for hair growth. It is the only form of hair removal recognized as permanent by the United States Food and Drug Administration. Electrolysis will eliminate your unwanted hair, give you new self-confidence, improve your appearance and attractiveness and change your life in a positive way. At your complimentary first appointment you will complete a health information form and I will assess any potential contraindications to treatment such as a pacemaker. I will then speak with you about the history of electrolysis, the science which makes it work, my high-quality approach to your treatment, new research within the field, the leading edge equipment I use and what you may expect from your treatments. Only when you are relaxed and all of your questions are answered will your treatment sites be examined. To ensure you obtain the most effective and comfortable treatment I will then perform a thorough skin examination and conduct a series of tests on your treatment site including tolerance and skin moisture tests. You will then be prepared for a demonstration of the electrolysis process. I will epilate and perform calming post-treatment on approximately a dozen hairs. I will provide you with a professional estimate as to the length and cost of your treatment, and advise on post-treatment care you should follow. After 48 hours have elapsed and you are satisfied with the comfort, effectiveness and after-effects of your treatment we will schedule your series of appointments. As my client you deserve an estimate of the number of hours it will take to clear all hair from your area of concern. As a result of compiling years of accurate client records for different treatment areas I will give you my best estimate of how long your treatment will take and how much it will cost. Please allow one hour for this very important first appointment. I pledge you will fully understand the science principles and methods of electrolysis and have all your questions answered before beginning your treatment.